Many parents who contact me are considering homeschooling because their child is miserable in school. Some are even failing. And sometimes, after hearing them describe their child, I may ask if they think he/she is gifted. Most parents say no. How could their child be gifted if they are doing poorly in school? Or maybe the child is a fairly quick learner in some subjects, but not in others. Their child’s teacher certainly doesn’t think he/she is gifted! Giftedness is so misunderstood, and it doesn’t always look like what we think it should look like – you know, the straight A quick learner who is every teacher’s dream. That is why I have been recommending the Gifted Homeschoolers Forum for years. From that website, parents can follow the links to great information, and can also sign up for an active Yahoo e-list. Great as the information is, sometimes it’s just too much for a parent who is struggling with where to begin (and sometimes it’s easier to share the information they are learning if it’s in book format). Making the Choice: When Typical School doesn’t fit your Atypical Child can be just what some parents need. It’s part of the Perspectives in Gifted Homeschooling Series. 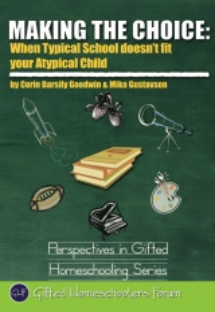 Authors Corin Barsily Goodwin and Mika Gustavson are highly qualified and have helped thousands of parents who have gifted kids. If your world is in a spin because you don’t know what to do with your child, being able to start with an introductory quick read helps a lot, and this book is only 56 pages. You’ll learn about gifted characteristics, and about gifted kids who have learning differences. And, you’ll get some sage homeschooling advice. I almost cheered when I came to the section where they tell parents not to over-plan at the beginning. They absolutely nailed the problem that so many new homeschoolers have! After reading this quick little book, you’ll be feeling a lot better and ready to move on to their recommended resources. Written by Karen Taylor, posted on 9 November 2012 at 1:31 pm, and filed under Gifted. Bookmark the permalink.